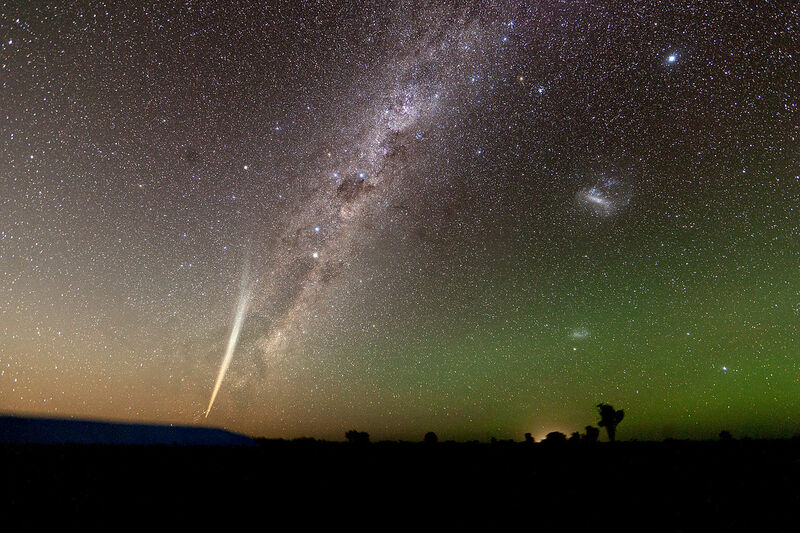 Comet or Asteroid: what is the difference? Because looking up the difference between a comet or asteroid drives me nuts. Small chunks of “stuff” that hang around in the solar system. Most describe some sort of orbit, but some pass once and we never see them again. They are much smaller than our moon, have very little gravity and therefore an irregular shape. More likely to be made from water ice or have a thick coating of water ice. The evaporating ice is what gives them an atmosphere that is not bound by the gravity of the comet (because the comet is too small). The water vapour gives them their tail. They originate in the outer solar system. Some asteroids have also been found to outgas water, while some comets have passed the sun so many times that whatever water ice they had on the surface has gone, leaving the rocky core. So yeah, there isn’t a clear line to separate between the two and no clear definition. For the sake of convenience, some people use the word asteroid for bodies that move in the inner solar system. The are more likely to be rocky. The large telecope at night. 2.55am and we’re receiving a signal from MSL in this windy, cold and rainy field. Photo by Martin Ollman. Oops, I dropped the umbrella! More space tweeps. I’m even in this one. Photot by Martin Ollman. So… does Alpha Centauri have any planets? A short follow-up on this post I made a while ago (note the tantalising difference in wording of the title). Just today, I stumbled across a scientific paper, thanks to a tweet by @b0yle, that outlines the priority of stars to which to send an as-yet-hypothetical interstellar mission (link here; the paper is not as jargon-laden as a lot of other scientific publications, so go read if this subject interests you). Short answer: we still don’t know. And with our current techniques, we can’t be certain. We’re getting very close, though. Some figures: there are 56 stars within 15 light years of us (give or take a few that may or may not be within this range and possibly very dim ones we haven’t yet discovered). Most of those are M-class stars, ‘red dwarfs’. There are also 2 G-class stars, like the sun (Alpha Centauri A at 4.4 ly and Tau Ceti, at 11.9 ly). According to current evidence, up to 30% of all stars may have planets. At this point in time, most discovered planets have been very large. The fact that we haven’t detected any in the Alpha Centauri system doesn’t mean that there are none. Planet size is expressed in number of times the planet is heavier than Jupiter. It is still fairly hard to detect anything significantly smaller than that. Yet evidence suggests that smaller planets could be more common than larger ones. Alpha Centauri is a star system of three stars (one K-class, one G-class–like the sun–and one M class). What is the statistical chance that none of them will have planets? A while ago, in this blog post, I mused about what the earth would be like with no moon. You may hear the Moon blamed for things as diverse as reproductive cycles and people’s moods, but in that post, I argued that if all of a sudden, we’d find ourselves without a moon, not a great deal would change. The Sun causes tides, albeit smaller ones, and any stability issues of the Earth’s axis would not change overnight. But this is not a realistic scenario. The Moon isn’t going to just disappear (the subject of Death Star-like blasting a planet apart is a subject for another blog post, but let’s just say it’s physically nigh impossible). The real question I should have asked is: what would life on Earth be like if Earth had never had a moon? If the Pluto-sized object that may or may not have collided with us to form the Earth and Moon as we know them had missed the Earth, and sailed straight on, to eventually burn up in the Sun. The situation would look vastly different. The Earth-Moon system is vastly different from other known planets in terms of relative size. Only the largest moons of Saturn and Jupiter are similar in size to our Moon, but those planets are of course much more massive. The Earth-Moon system could well be referred to as a double planet. Of course Earth and Moon affect each other, and this influence comes in the form of gravity. While the gravity of the Moon affects all surfaces of the Earth equally, it’s only the oceans that can react to this gravity. Yeah, that’s how the tides are formed. Imagine the Earth as an oblong bubble of water, with bulges both on the side where the Moon is at and the opposite side. This bulge orbits the Earth at the rate the Moon does. But the Earth itself rotates inside this envelope of water, and this creates friction at the place where water and solid surface meet. In effect, the water is forever trying to keep up with the planet. Friction creates warmth, and yes, loss of speed. So it is that over the four-plus billion years of the Earth’s lifetime, the rotation speed of the Earth has slowed from an eight-hour day to our current twenty-four hours. Is still slowing, in fact. Of course life on a planet with days of eight hours would be very different. We’d experience vastly more powerful weather and especially wind systems. With a rotation speed like that, there would probably not be much opportunity for much North-South weather movement, but we’d have strong bands of air movement, much like Jupiter (which has a daylength of ten hours). We’d have similar ever-lasting cyclonic systems. And what would it do to the seashores, having the tides jump up twice in eight hours? Or to the biology of animals evolving with that kind of daylength? Would we all have nervous tics from seeing the Sun whizz by? By pattyjansen  Posted in astronomy, Science	 Tagged astronomy, science, the Moon, what if the Earth had no moon?